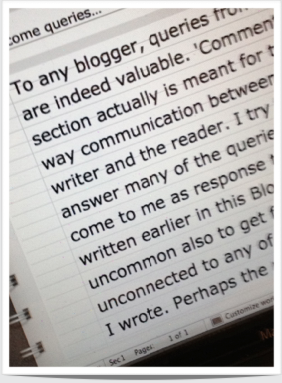 To any blogger, queries from readers are indeed valuable. ‘Comments’ section in blogs admirably fulfills the need by actually facilitating two-way communication between the writer and the reader. I try to answer many of the queries that come to me as response to what was written earlier in this Blog. It is not uncommon also to get fresh queries unconnected to any of the Posts that I wrote. Perhaps the reader feels a sort of comfort in asking those questions that are not discussed about but indirectly reading my responses written with a personal touch, is encouraged to ask. Why this question arose in her mind was because she “was told this by another…..on Facebook…”. Fair enough! I am giving below what I replied to her. According to Vedanta, the Divinity is within us and is pure, untainted, immutable, etc. Therefore, no karma, good or otherwise, will affect it. It is thus easy (most of the times wrongly) to conclude that there can be no connection between morality and the divinity of the soul. 2. All our great Teachers and spiritual luminaries were men and women of great moral and ethical standing. In fact, one may say that their greatness lay in no small measure upon their moral basis of their existence. 3. 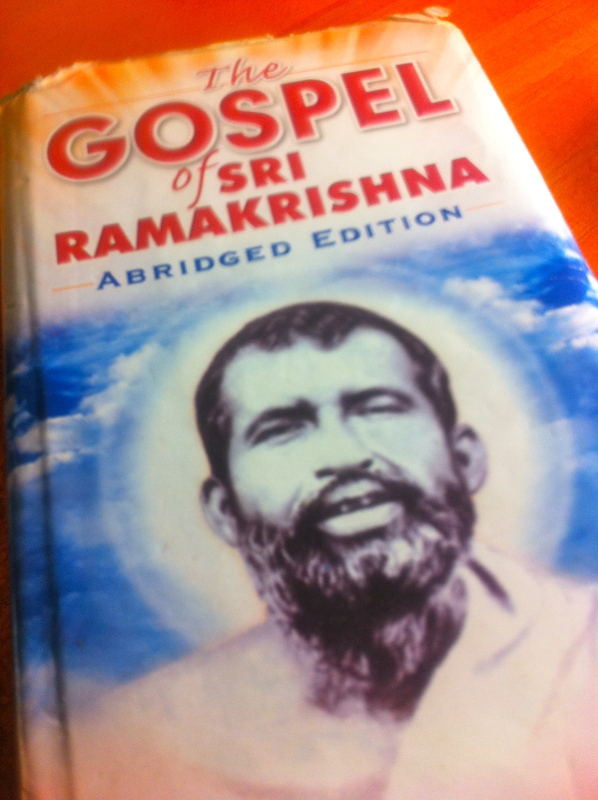 It is therefore that we find in the ancient Upanishads, Gita, Ramayana, and the modern scriptures like the Gospel of Sri Ramakrishna, etc, such an emphasis on right conduct. 4. In the Yoga Sutras of Rishi Patanjali: Yama and Niyama (the do’s and don’ts of spiritual life – the basic moral code of conduct) are presented first, and then only the the other steps (asana, etc ) follow. 5. The recommended steps in any spiritual practice does nothing more than reveal the Divinity that is hidden from us. Just as scum covers the surface of the pool and we cannot see the water, so too ignorance / attachments / desires /actions (good / bad) / egotism, cover the atman. Sadhana is a means of removing ignorance – as much as one sees the clear water only when the scum is removed. 6. The instruments to do this are the very same instruments that will bring about release from the samsara chakra – cycle of births and deaths. 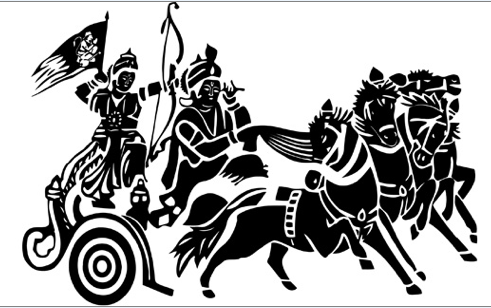 Cf: the chariot image in Katha Upanishad. The soul is the master of the chariot, the body is the chariot, the intellect is the charioteer, the mind, is the rein. In the ordinary being, as Swami Yatiswarananda says (in Meditation and Spiritual Life – I hope and wish that you must get a copy through RH) that the soul is drunk; intellect, the charioteer, has fallen unconscious; the reins, the mind, have become slack; the horses, the senses, are running wild. And a great disaster awaits . Unless we do something. That is lead a controlled life based on moral principles. 8. That which is selfish is immoral, and that which is unselfish is moral. 9. All great teachers and social reformers had this in common — all were unselfish; had turned away from their little self to the rest of the world identifying with the Universal Self. According to the Advaita philosophy, the differentiation of matter hide the real nature of man; but the latter really has not been changed at all. In the lowest worm, as well as in the highest human being, the same divine nature is present. The worm form is the lower form in which the divinity has been more overshadowed by Maya consisting of the three gunas; that is the highest form in which it has been least overshadowed. Behind everything the same divinity is existing, and out of this comes the basis of morality. “Do not injure another. Love everyone as your own self, because the whole universe is one. In injuring another, I am injuring myself; in loving another, I am loving myself.” From this also springs that principle of Advaita morality which has been summed up in one word – self-abnegation. The Advaitin says, this little personalised self is the cause of all my misery. This individualised self, which makes me different from all other beings brings hatred and jealousy and misery, struggle and all other evils. And when this idea has been got rid of, all struggle will cease, all misery vanish. So this is to be given up. We must always hold ourselves ready, even to give up our lives for the lowest beings. When a man has become ready even to give up his life for a little insect, he has reached the perfection which the Advaitist wants to attain; and at that moment when he has become thus ready, the veil of ignorance falls away from him, and he will feel his own nature. Even in this life, he will feel that he is one with the universe. For a time, as it were, the whole of this phenomenal world will disappear for him, and he will realise what he is. All that we call ethics and morality and doing good to others is also but the manifestation of this oneness. There are moments when every man feels that he is one with the universe, and he rushes forth to express it, whether he knows it or not. This expression of oneness is what we call love and sympathy, and it is the basis of all our ethics and morality. This is summed up in the Vedanta philosophy by the celebrated aphorism, Tat Tvam Asi, “Thou art That”. Lord is pure; therefore those who have this sameness for all, and are pure, are said to be “living in God.” This is the gist of Vedantic morality – this sameness for all. May Master be with you and bring you peace and prosperity! Thanks for this beautiful article in the form of a letter. I am sure that this divine person will be in awe with the reply from Maharaj. Glad I am able to read this article even though miles……. away, it brought thoughts of my Mother. I always wondered how strong she is, but recently realised that this is not strength, it is Divinity. I thank Master for having ‘her’ in my life. Just yesterday, I was trying to recollect (I decided to search CW where Swamiji gave this explanation in Raja Yoga) and here I get it in my inbox “Ready Reference”! More often than not we, ordinary humans, think that just because we keep company of spiritual people, attend satsangs, do our pooja, it absolves us from unGodly intentions and actions…how easy it is to speak sweetly to a neighbour yet use harshness with one’s own child, spouse or family member…when we were born we were born innocent, along the way we learnt different kinds of behaviour, thus influenced by many within our own society…that taught us to feel differently for one another. In reading your Blogs about family values, living within the extended family, all teach us patience, tolerance, forgiveness…but in all this we must want change, we must be able to see better for our self then only can we rise above the scum that veils us in ignorance…it is difficult to find truth…and I maintain that Truth is what we feel, its a recognition…and I am sure AG found that in asking you, she would find her answer…God Bless and Best wishes to you always…! Thank you S. Vimokshananda for your wise words! I too struggle with the idea of morality vs. non-duality. If it is true that in absolute advaita there is no individual self then why bother with following any moral code of conduct? But as you point out in 5 above we cannot see Atman, our true self, covered in passion and attachment. I still question though whether only a path of devotion and moral behavior can lead to abidance in Brahman, because I believe only through negation, and therefore through knowledge can we know absolute existence. om. peace, peace, peace. Thank you so much Swami Vimokshananda ji! I’m feeling extremely relieved and easy after reading this article. This is invaluable, this is the ‘Saransh‘ of human life something which my mother and sisters have always taught me throughout my life. But, sometimes it does become difficult to lead a perfectly acceptable moral life due to the cobwebs of social, familial and legal boundaries, responsibilities and obligations we have been stitched with. That’s why my mother always insists upon reading the holy books (any language) like Kathamrita, Gita, Ramakrishna’s Vani, Ma Sarada Devi and Swami Vivekananda’s sayings and even the books written on the great patriots who have played an unputdownable role in relieving their respective nations from the clutches of the intruders for moral upliftment and enlightenment. Something, I still fail to understand that why is it so difficult to maintain and live a peaceful and respectable life even if you don’t have the tendency to mess up with others, even if you love and respect others and follow the path of honesty and hate dishonesty? Why does a honest guy always have to be at the receiving end? Why does the people who believe in god don’t believe in their own peers and well-wishers? Why are we losing faith on each other? How can we stay together and lead a peaceful, productive and fruitful life in spite of having some differences? There are many more to it…………I would again like to thank you a lot for these words and wish to read more of you, from you and with you. Your posing many questions on this important topic indicates that you are indeed self-introspecting person. This is a wonderful practice wherein the questioning mind is deeply awakened. Thats how we find answers to our doubts. I would not go into the answers that you are looking for in this Comments column for lack of space but I would advise you to go through the writings and speeches of Swami Vivekananda. His social ideas covering the moral, ethical values are relevant even today. May the ever gracious Lord who is within you guide you is my prayer!